What is VaporFi Vape Juice Made Of? VaporFi e-juice is among some of the highest quality products on the market today. 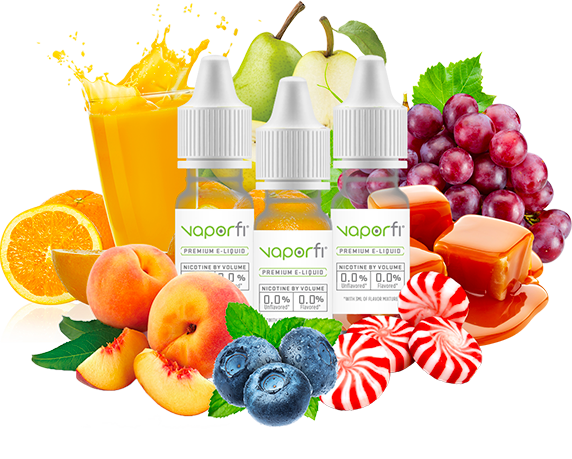 Vapers from all over the world flock to VaporFi for our juice because it is made from quality ingredients and comes in more varieties than you can find anywhere else. So what exactly goes into making a bottle of delicious VaporFi vape juice? What Ingredients Go into Our e-Liquids? Vape juice is made from four main ingredients. The first two are propylene glycol (PG) and vegetable glycerin (VG). Both of these chemicals are widely recognized carriers used to deliver the other ingredients. They are both safe for human consumption and have been used in medical treatments, food production, and other industries for a very long time. Propylene glycol is colorless and odorless and is known for producing the throat hit that you feel when you first inhale. On the other hand, vegetable glycerin has a light yellowish color and a lightly sweet taste. It is used to produce denser vapor clouds so that you feel full with each inhalation. The other two ingredients are liquid nicotine and flavoring. Nearly all flavoring is made from propylene glycol as well, which makes it easy to mix into vaporizer liquid. The nicotine is basically a purified nicotine product that has been derived from actual tobacco leaves. It is highly concentrated on its own and must be mixed with the other ingredients to dilute it down to the proper level. When mixed with the other e-juice ingredients and vaporized, the nicotine can be readily absorbed through the mouth and throat so that you can enjoy your nicotine fix without having to smoke. What Makes VaporFi Vape Juice Special? There are hundreds of companies that are producing e-cig flavors today. When you are comparing brands, it is extremely important to look into their production process and where they source their ingredients from. VaporFi goes to great lengths to get the purest, safest ingredients available to ensure that every bottle of juice meets the same consistent standards for quality. There are some companies who do not want to share their ingredient lists, or who buy impure liquid nicotine and try to pass it off. Here at VaporFi, quality is our number one concern, and we have completed ISO certification and other measures to ensure that every ingredient that enters our facility will live up to your expectations. Shop Your Favorite Vaporizer Flavors on VaporFi Australia Today! To explore the full collection of VaporFi juice flavors, visit us online or create your very own flavor on our website! DOW: Get 10% Off the Innokin Proton 235W TC Vape Starter Kit! Unwind in Style With This Month’s Contest Winner, Marshmel Tobacco!